As the U.S. population ages, the populations of nursing homes increase. Senior citizens are among the most vulnerable people in our society, particularly when they are living in situations that make it difficult for them to defend themselves. Today, more than 3.2 million adults in the U.S. are living in nursing homes and long-term care facilities. Many receive excellent care, but sadly, many others are victims of abuse and neglect. Most cases of nursing home abuse are committed by the caregivers working in the facility. If your loved one is in a nursing home and you suspect abuse or neglect, it is important that you know what to do and then take action immediately. Schedule a free consultation with a nursing home abuse lawyer at GibsonSingleton Virginia Injury Attorneys today for legal advice on the best way to proceed. Physical abuse: Any condition or event that causes physical harm, including pinching, hitting, restraining, or failing to provide the needed physical care. Sexual abuse: Unwanted sexual attention or exploitation, including sexual attention to residents with dementia. Emotional abuse: Intimidating or demoralizing treatment, which may include criticizing, shaming, humiliating, or yelling at a nursing home resident. Resident-to-resident abuse: A growing problem in which one nursing home resident is allowed to abuse another. Financial exploitation: Caregivers with access to a nursing home resident’s financial information steal or compromise a resident’s financial status. Neglect: The nursing home fails to take care of needs such as personal hygiene, food, clothing, and water, often because of not having enough staff. What are signs of nursing home abuse and neglect? It is critical to contact an attorney if you know of, or suspect, nursing home abuse. 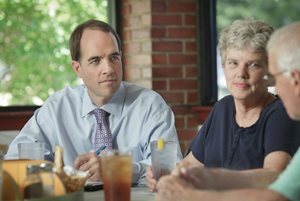 When you come to us for help at GibsonSingleton Virginia Injury Attorneys, a nursing home abuse lawyer can work with you to gather the facts of the case, report abuse to the proper authorities, make sure that your rights are protected, and file a lawsuit for damages on behalf of your injured loved one. Once a lawsuit is filed, we continue to gather and develop the evidence through interviews, depositions, and medical expert opinions. Your case may be resolved in a settlement or proceed to court. Our Virginia injury attorneys have a successful track record in the courtroom, and we are not afraid to go to trial to fight for your loved one’s rights. We work on a contingency basis and do not get paid unless we recover compensation for you. Contact us or call us at (804) 413-6777 or toll-free at (855) 781-6777 for a free consultation.